New Zealand Government is pleased to offer Commonwealth Scholarship and Fellowship Plan in 2018-2019 academic sessions. 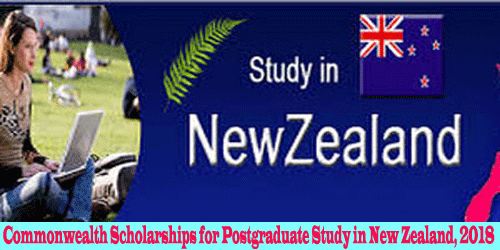 Scholarships will be awarded to undertake Masters or Ph.D. studies in New Zealand. New Zealand Scholarships empower individuals with the knowledge, skills, and qualifications to contribute to economic, social and political development within selected developing countries. Applicants must be applying for direct entry to a Masters or Ph.D. programme at a New Zealand university. As a general rule, for those wishing to complete a postgraduate qualification an overall IELTS score of 6.5 and no band less than 6.0 is the minimum required. Course Level: Scholarships are available for pursuing Masters or Ph.D. studies in New Zealand. Pacific: Cook Islands, Fiji, Kiribati, Nauru, Niue, Papua New Guinea, Samoa, Solomon Islands, Tonga, Tuvalu, Vanuatu. Have resided in your home country for at least two years immediately before commencing your scholarship. Important note: this condition does not apply to applicants who are members of the diplomatic corps or their dependants, and may not apply to applicants for Short Term Scholarships. Have at least two years of work experience (part-time or fulltime, paid or voluntary). Important note: this condition does not apply to applicants from the Pacific who are applying for a pre-service scholarship -Not be serving military personnel. English Language Requirements: Applicants from outside the home country will often need to meet specific English language/other language requirements to be able to study there. How to Apply: The application process for a New Zealand Commonwealth Scholarship is different to other New Zealand Scholarships. Applicants must submit their applications to their country’s ‘Nominating Agency’ first. The Nominating Agency then ‘nominates’ two applicants from the submitted applications to send to the New Zealand Ministry of Foreign Affairs and Trade. Read the Commonwealth section of the How to Apply page carefully before you apply. 0 responses on "Commonwealth Scholarships for Postgraduate Study in New Zealand, 2018"